Happy Wednesday! 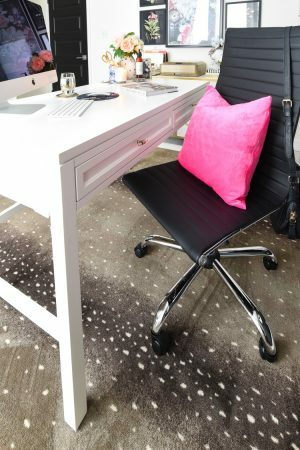 I know things have been quiet on the blog front, and it’s because I allowed myself some time off after completing an office makeover, a dining room makeover, a spring home tour, a master bathroom makeover, and a master bedroom makeover all within the first 4 months of the new year. Oh and in between all of that making over, I went to High Point Market in April as part of the Design Bloggers Tour! I wrote about the highlights, color trends and today I’m wrapping it up with styling and decor tips/ideas I garnered from market this year. It’s obvious I love decorating…I mean, I have a blog and all. However, I do find it challenging to decorate three things: bookshelves, console tables and gallery walls. 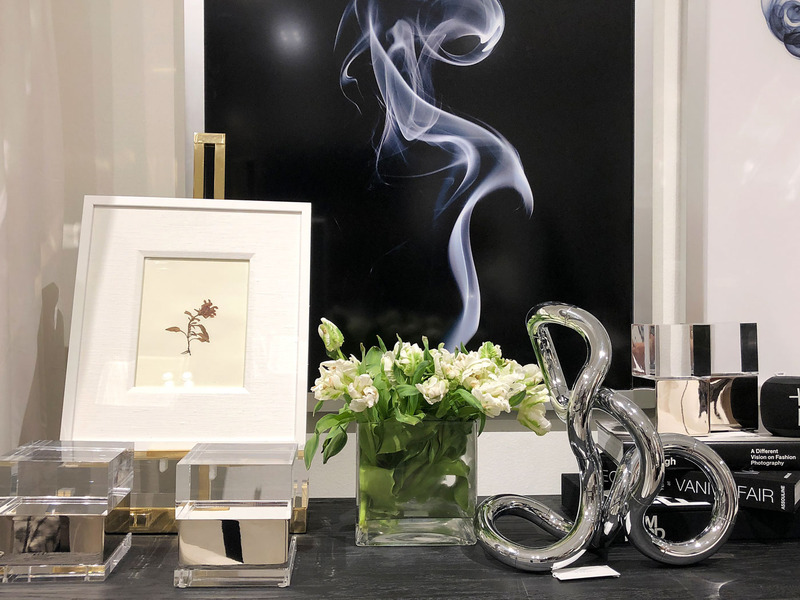 So, I was specifically on the prowl for those things while at High Point Market. Normally relegated to long foyers and hallways, console tables can be a versatile furniture piece. They can add storage, color and style, but most importantly they can hold pretty decor, lamps and serve as a great place to hang some art. 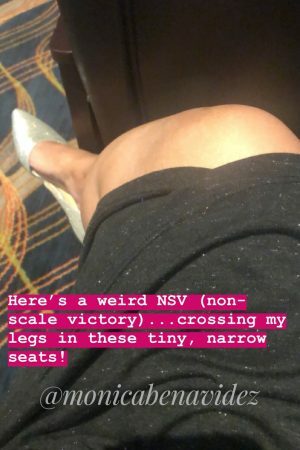 The image below is from E.J. Victor (my fave showroom! ), and it caught my eye due to the black/white/gold color palette. 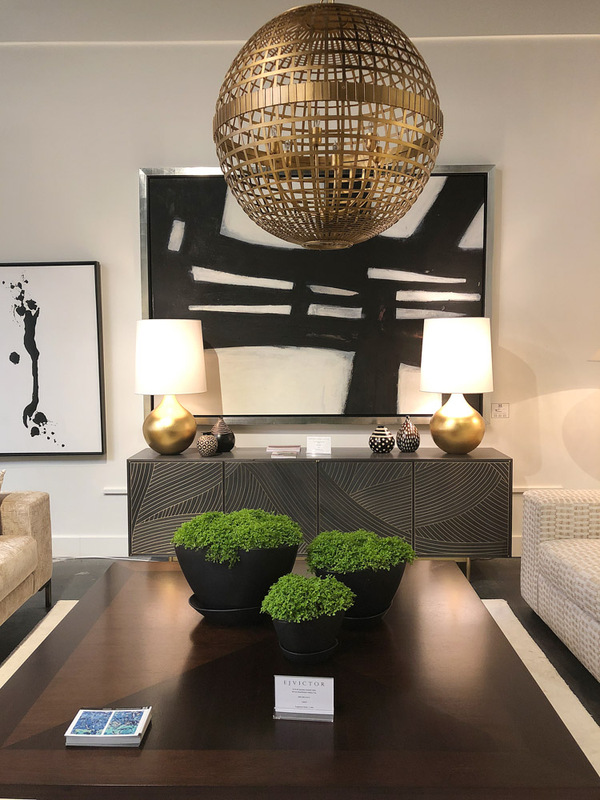 I love the simplicity of the lamps and decor on the console, and I adore the over scaled, abstract art print that is also the same width as the console table itself. 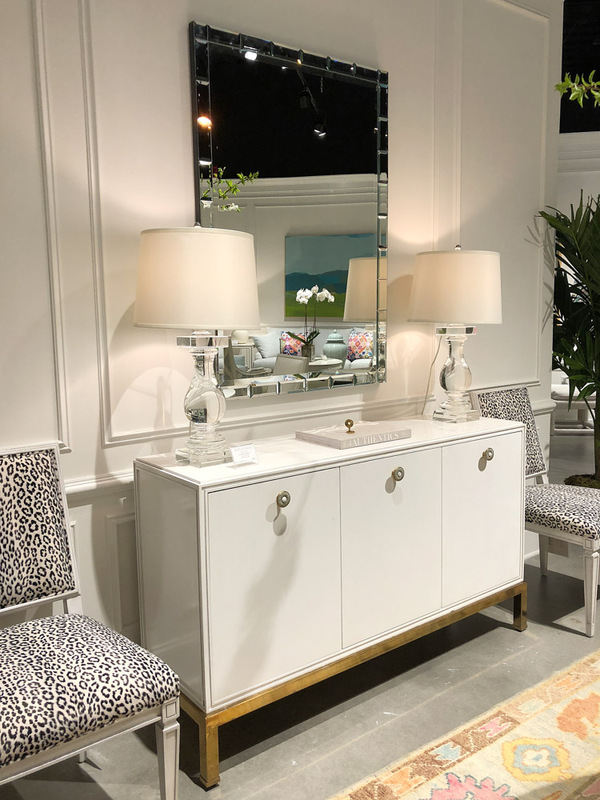 Over at Highland House (part of the family of brands that Century Furniture is in), I was also struck by how elegant and simple this console table vignette is. I have similar lamps that I recently moved out of our master bedroom, so I’m thinking I may need to restyle my foyer table for summer. And finally at Michael Dawkins Home, this console table/desk set-up had me smitten the moment I walked into the showroom. 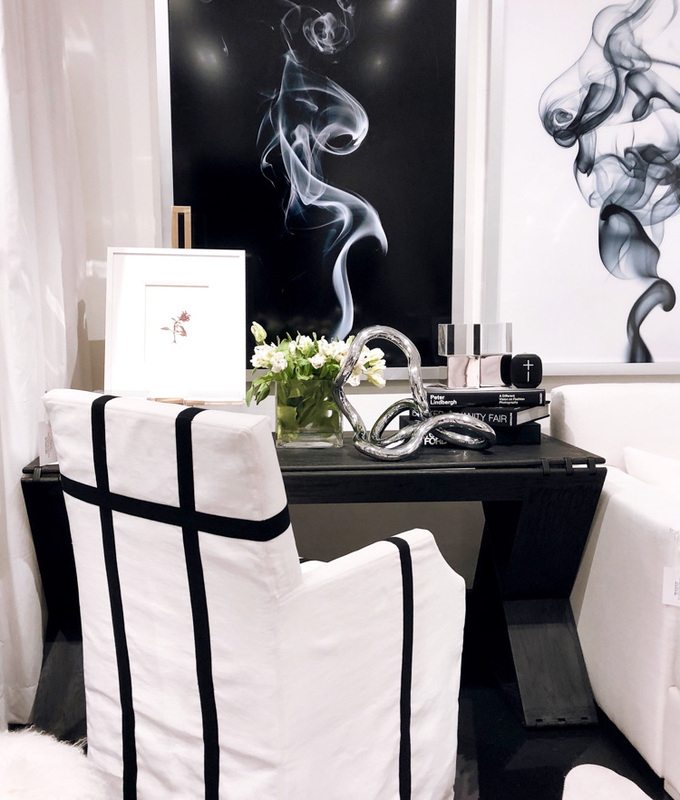 I love the easel artwork, the florals, the chrome tabletop sculpture piece and the crisp black and white contrast. 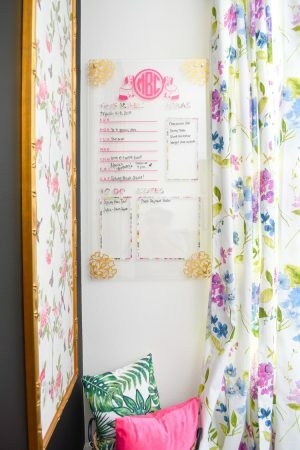 This would work beautifully in a feminine office or bedroom. If you follow my Instagram stories, you know I was freaking out about the gallery wall in my master bedroom for the One Room Challenge. I find gallery walls really intimidating because they require precision and a lot of thought to pull off. The pros at High Point Market really love their gallery walls because I saw them all over the place! Here’s my top 3. 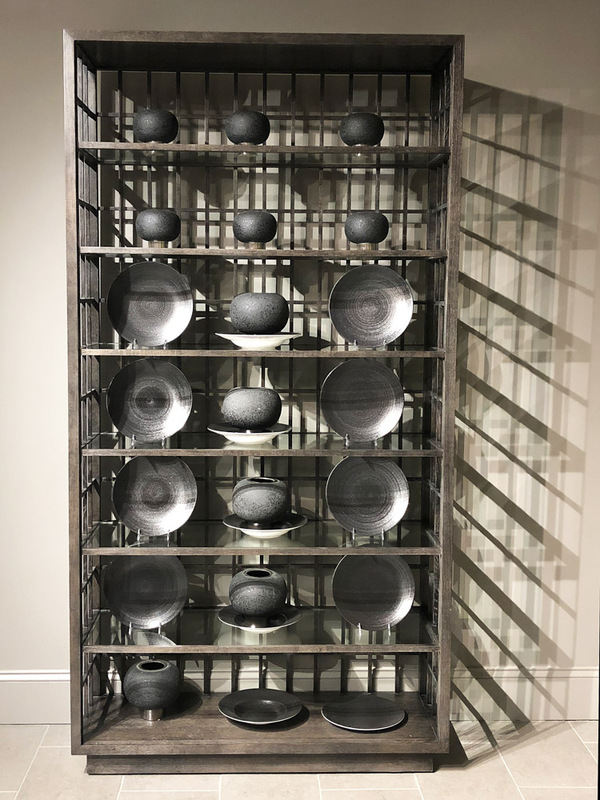 I think we all have those odd spaces in our homes where we don’t have much wall to work with, which is why this set-up from Universal Furniture really spoke to me. I’d likely ditch the chairs, but I really love the simple, non fussy gallery wall and end table under it. Cohesive, chic and works for small and tight spaces. 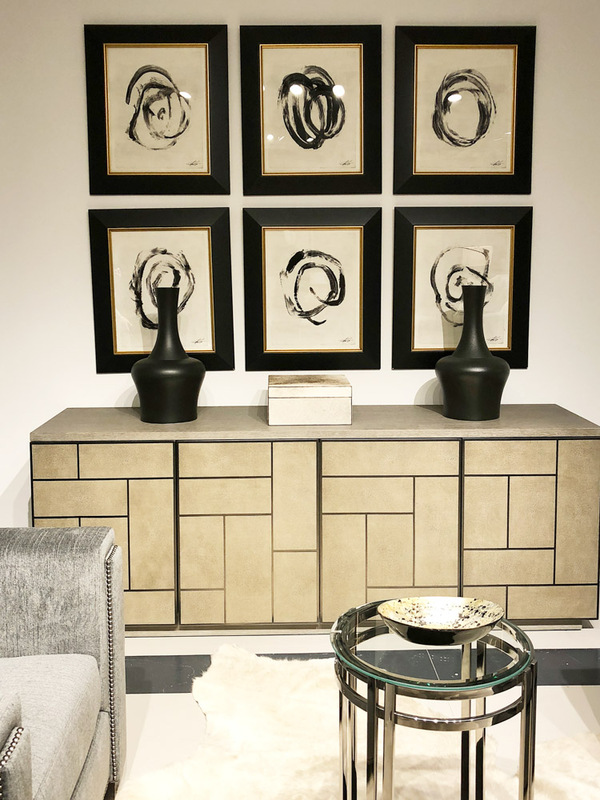 Over at Bernhardt, this gallery wall appealed to my symmetrical loving heart. I feel the styling here really plays off a few trends and meshes them all together for a look that is timeless, yet bold and fresh. 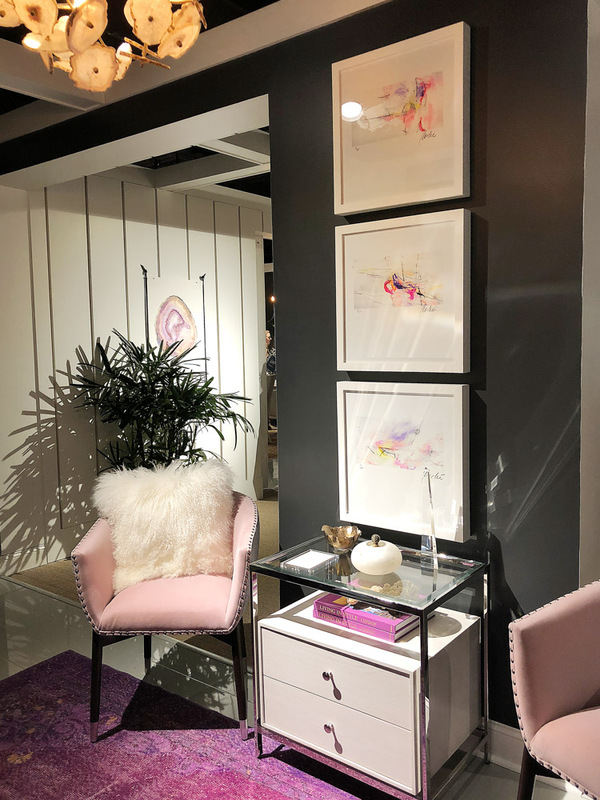 One of my other showroom crushes was at Rowe Furniture– this set-up styled by the talented gentlemen over at Parker Kennedy Interiors was stylish and pink perfection from top to bottom. 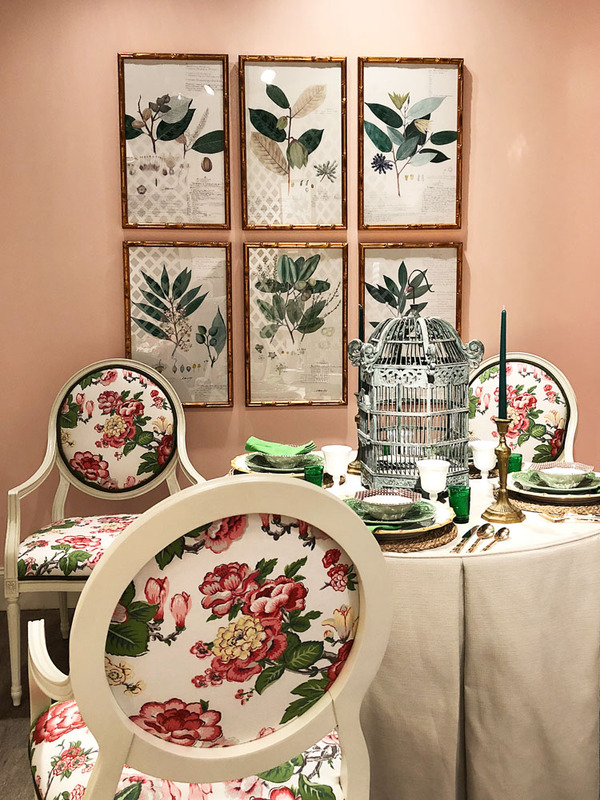 Again, a simple gallery wall with botanical inspired prints and gold accents really amped up the glam in this dining nook scene. 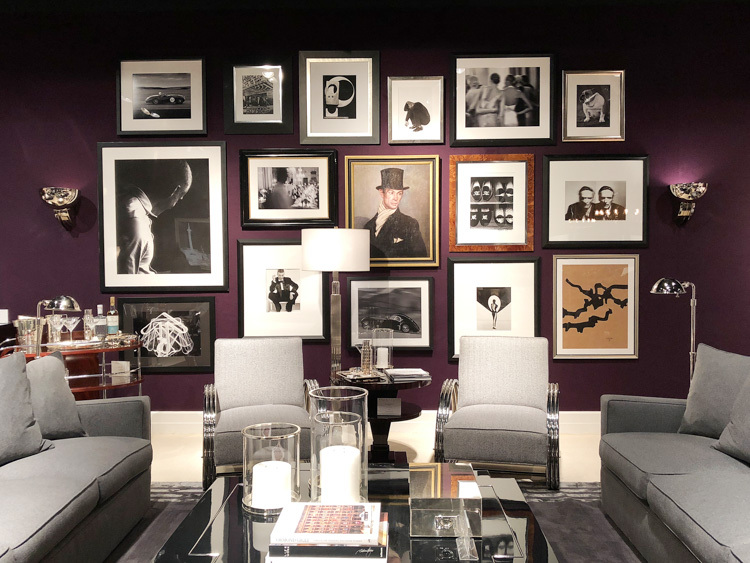 And I can’t not post this photo again from Ralph Lauren Home… the matte purple wall, the eclectic vibes, the sophistication exuding from this whole space is sheer bliss. I think part of my apprehension at pulling the trigger on built-ins for the living room is the fear of decorating them! I always struggle with adding books, vases, decor, art or what not to them, and truthfully I do not believe you can go wrong with simply displaying what you love. 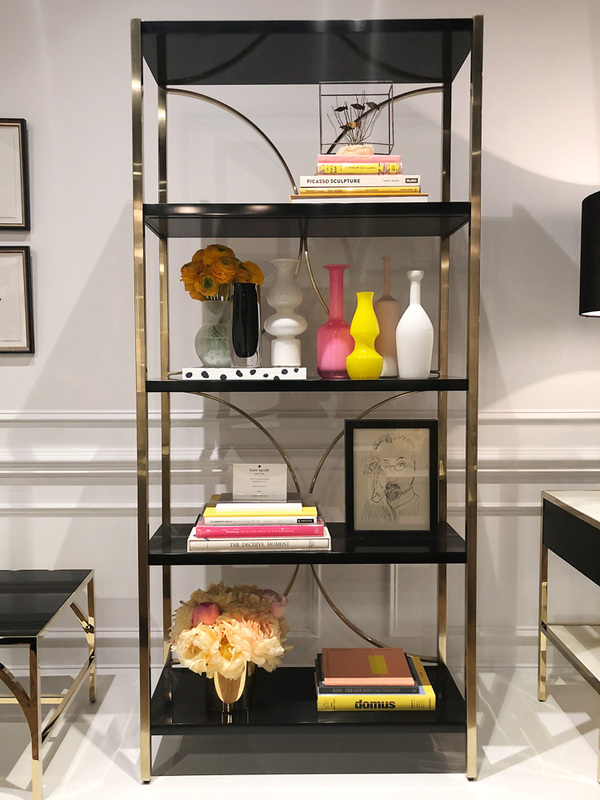 At Adriana Hoyos, I love how they worked with a gorgeous midtone, warm bookcase to make it stylish, modern and polished. The back of the bookcase has geometric metal accents that to me were very unique and surprising. Their whole line was a breath of fresh air. 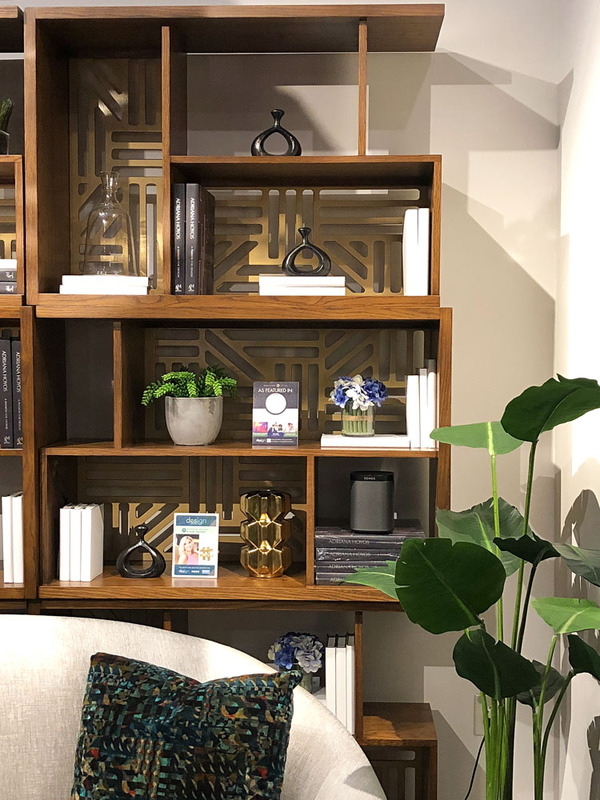 This etagere is giving me fun summer vibes, and I love the use of various accessories such as books, florals and vases, but I also love the empty or negative space left to let the whole thing breathe. And one of my suggestions for curating or decorating a bookshelf is to do a collection of things if you don’t really want to style/think too much, and here’s two fantastic examples. 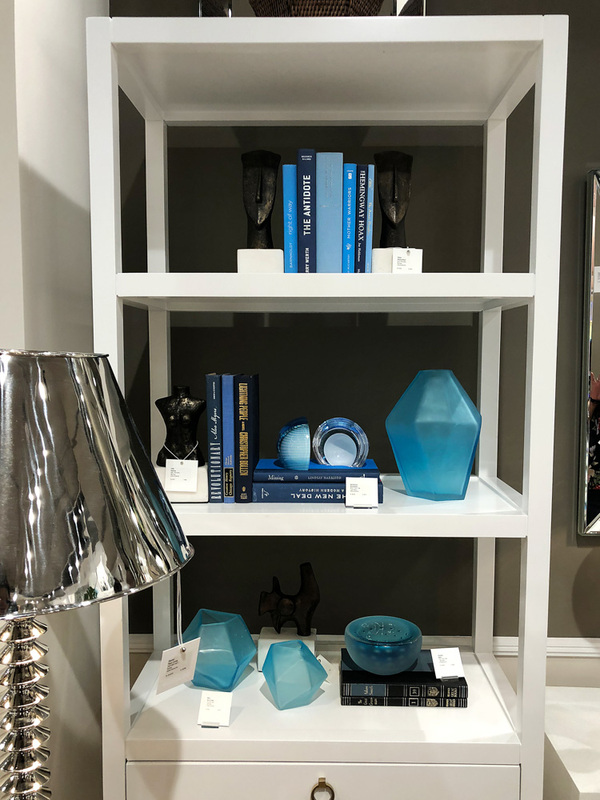 At Bungalow 5, all the accessories on this white etagere are blue and work together beautifully. And Bernhardt’s simple, monochromatic styling of this piece is stunning. Those shadows alone make the piece even more dramatic. Hope there’s some new styling idea or tip you’ve picked up from this post. Let me know your fave, and I bet you’ll find some of these ideas in my summer home tour coming up in June. I’ll be back Friday with an update about this blog and the direction it’s going to go in. I’m not shutting down shop exactly, but things will be shifting a bit.